We have really enjoyed our stay on Bald Head Island and wish we could stay longer. The weather is dictating that we leave today or miss our window for our next overnight trip offshore. We plan on spending more time on the island this fall when we head south. Leaving the harbor at Bald Head, we soon pick up the ICW inside route for part of today’s trip. Just past The Cape Fear Inlet are the Frying Pan Shoals. These treacherous waters are know as the graveyard of the Atlantic and stretch almost 20 miles offshore. We will avoid these shoals by running inside on the ICW to Wrightsville Beach. Had we run the ocean route around these shoals it would have been 61 miles to Wrightsville Beach. 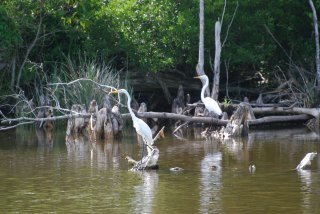 The ICW route is only 22 miles. 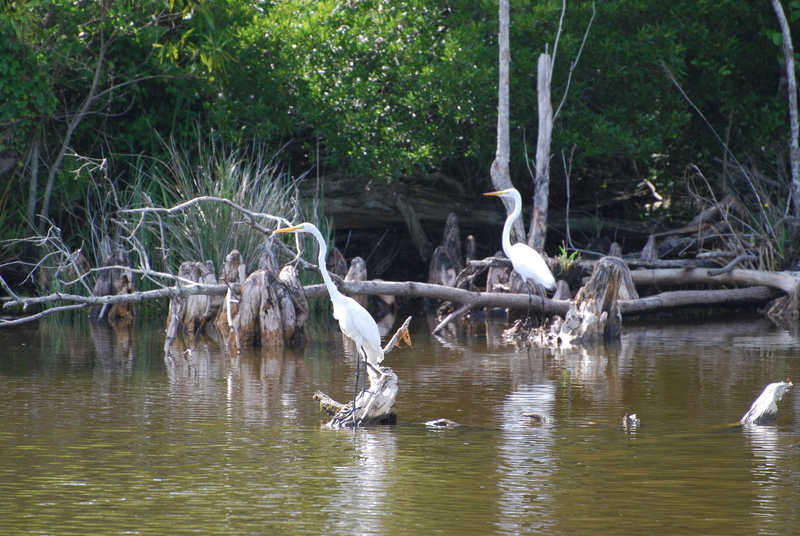 Like many other areas of the ICW, parts of today’s route have some skinny water. We time our departure so as to be on a high tide. The current must also be considered as the Cape Fear River has some strong tidal currents. 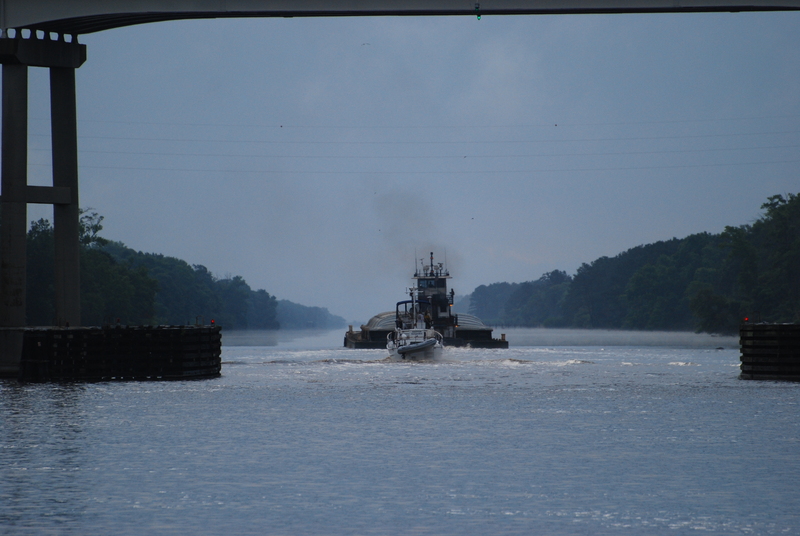 Leaving the Cape Fear River, we enter Snows Cut, an area prone to shoaling. We hug the red markers as advised in Active Captain and never see less than 12 feet of to depth. The next 12 miles is through a dredged channel along the marsh. Nearing Wrightsville Beach, we take Shinn Creek to the Masonboro Inlet. 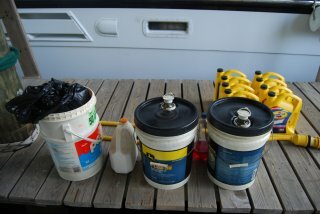 We have decided to fish offshore all day and then run overnight to Beaufort. The Coast Guard is conducting live fire exercises and has part if this area blocked to navigation. We head 15 miles offshore to avoid the gunfire. Soon the fishing rods are back out. The ocean is like a lake today with seas of only one foot. The water is a crystal clear blue with incredible visibility. With the sound of the rod singing, we race to the back deck. The line continues to pay out for several hundred feet. Looks like a good one. I take the rod and reel as hard as I can until my arms give out. Jeff’s turn to bring it in. 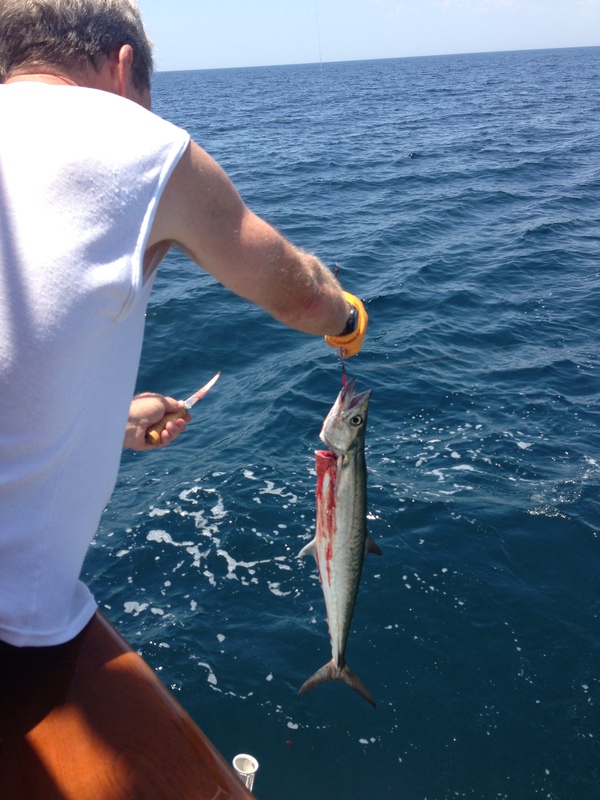 We soon have a King Mackerel on board. 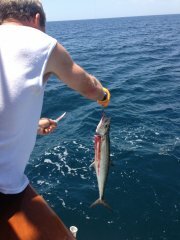 It is a small one of maybe 10 pounds but we I’ll take it. Jeff filets several meals of fresh fish out on the dive platform. 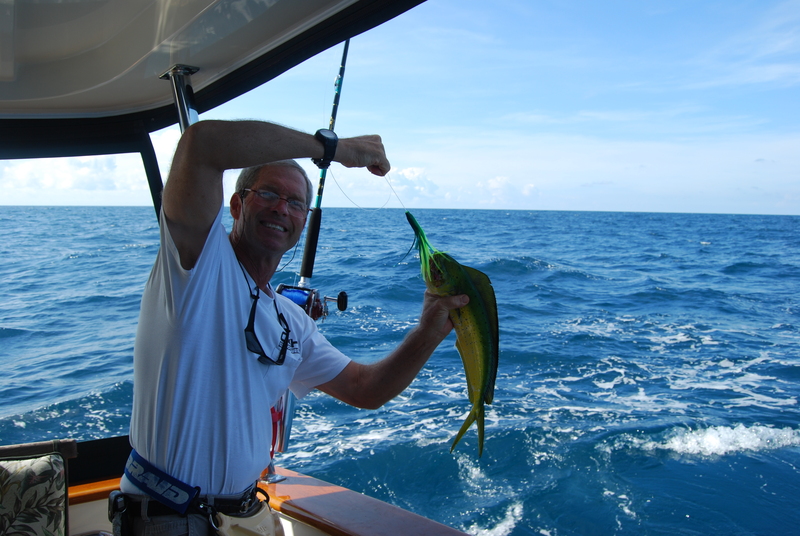 A few minutes later the line is singing again and we have a small Mahi hooked up. This guy is little so we let him go back. We have quite a few more bites over the afternoon but none that take the bait. We fish until after dark before calling it a day. The seas pick up during the night and the winds shift. We have a lumpy ride through the dark hours as we rotate watch. Our arrival time to the Beaufort inlet is 3:00 AM. Not wanting to enter in the dark, we do some circles to kill time. 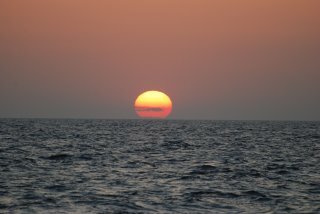 We are happy to see the new dawn as the seas have continued to build. Darkness seems to always magnify the sea state. 5:30 AM finds us at the outer markers to the Beaufort Ship Channel which leads into Morehead City. It is busy with many fishing boats heading out for the day. 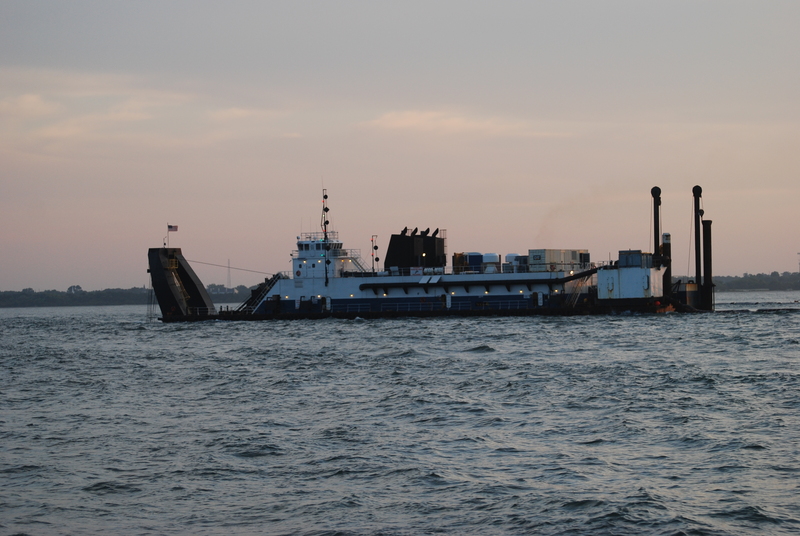 The dredge “Charleston” is in the center of the channel so we maneuver off to the side following the temporary buoys . Our decision to wait until daylight before entering the inlet was a good one. While heading in, we monitor a conversation with the Coast Guard and a freighter. Apparently there was a 28 ft. Sailboat that had departed Morehead City the day before and the husband had died. The wife was in a panic and the freighter came to her rescue. 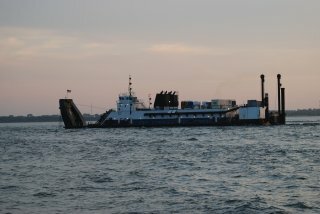 The freighter was doing a radio relay to the Coast Guard and they were on their way to rescue her. Poor lady, her husband was only 49 years old. Just past Moorhead City, we transit Adams Creek, a dredged channel lined with boat lifts one after another. This 12 mile long waterway brings us to the Neuse River. The shrimp boats are out in full force this morning. 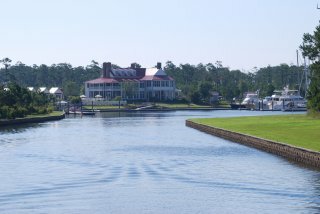 Just past Oriental, NC, we reach River Dunes Marina and call it a day heading in for some much needed sleep. We have a leisurely start to the day as we only have 45 miles to run. Sebastian enjoyed a nice walk through the residential development this morning. We were surprised to find there were not many more homes built than when we were here six years ago. Someone has invested a lot of money into this development but the return on the investment doesn’t seem promising. The homes and development are all beautiful and well kept. The largest town around is Oriental about 10 miles north but not large enough to support such an expensive community. 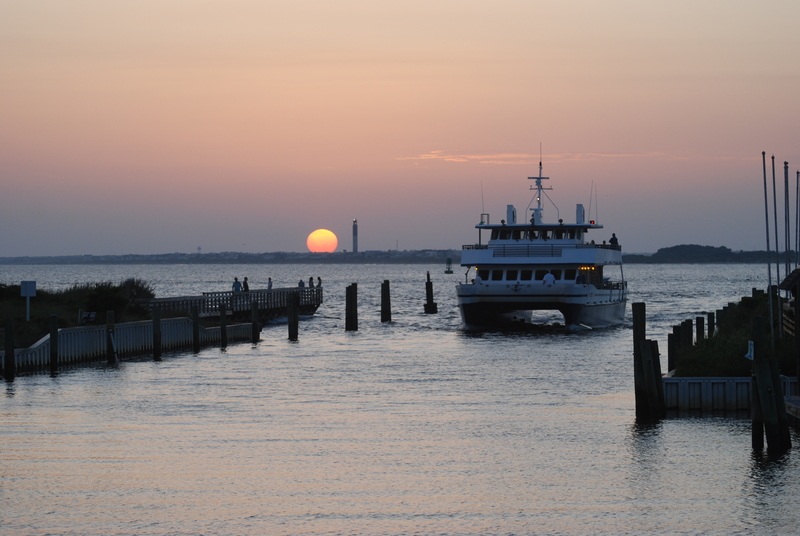 We are thankful that they offer transient dockage here as the facilities are first rate. We slowly glide out the River Dunes Canal into Broad Creek which takes us south to the Neuse River for our short travel day. We then follow Goose Creek and cross the wide expanse of the Pamlico River into the Pungo River. Cruising is easy today with no depth issues and a wide channel to traverse. The temperatures are record breaking with the heat index above 100 degrees. 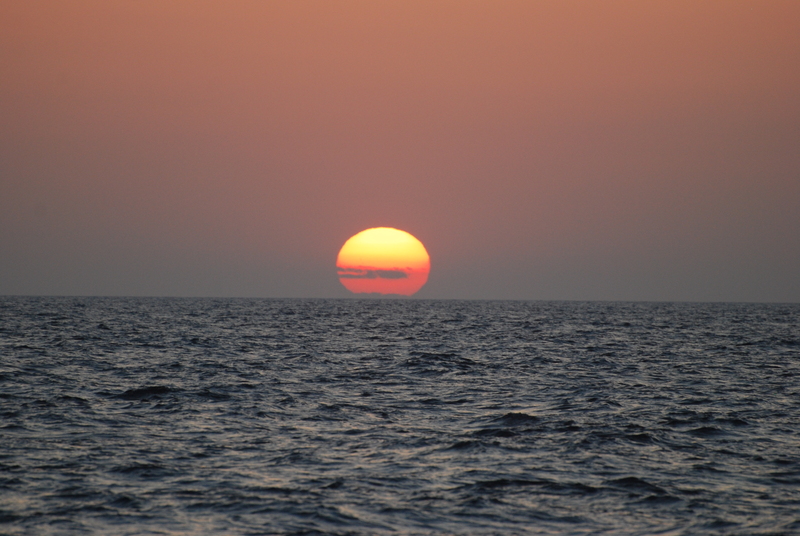 Normally we would anchor out as there are many scenic stops available but it is just too hot. 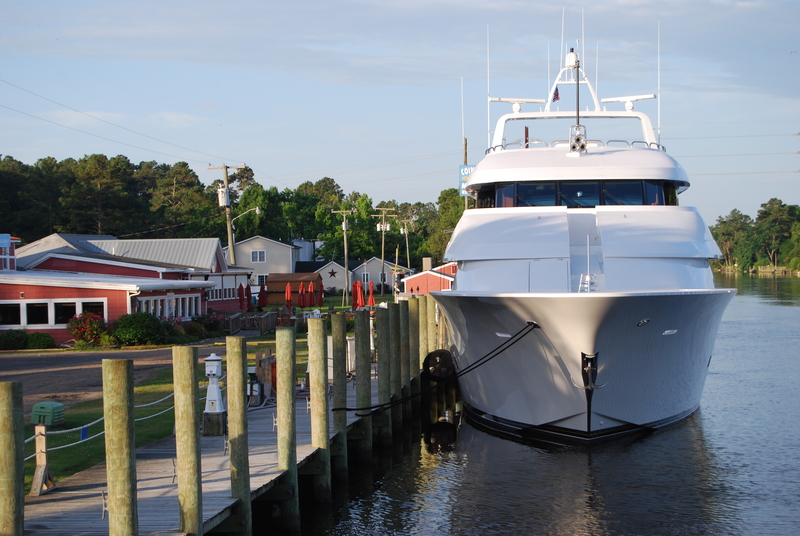 We opt instead to stop for the evening at Dowery Creek Marina just off the Pungo River. We have been here twice before and the face dock is an easy in and out. It is a no frills marina but does offer a pool and courtesy car for transient boaters. After getting IT secure, we sign out the car for a trip into Belhaven, 5 miles away. We wanted to check out the other marinas in the area. We didn’t find much in town and are happy with our choice of dockage as the two other marinas in Belhaven are not very impressive. Back at Dowery Creek, Jeff takes advantage of the pool for a quick dip to cool off. It is early to bed tonight as tomorrow will be a long day. We have a long 80 mile day today so we are away from the docks at 6:00 am prompt. 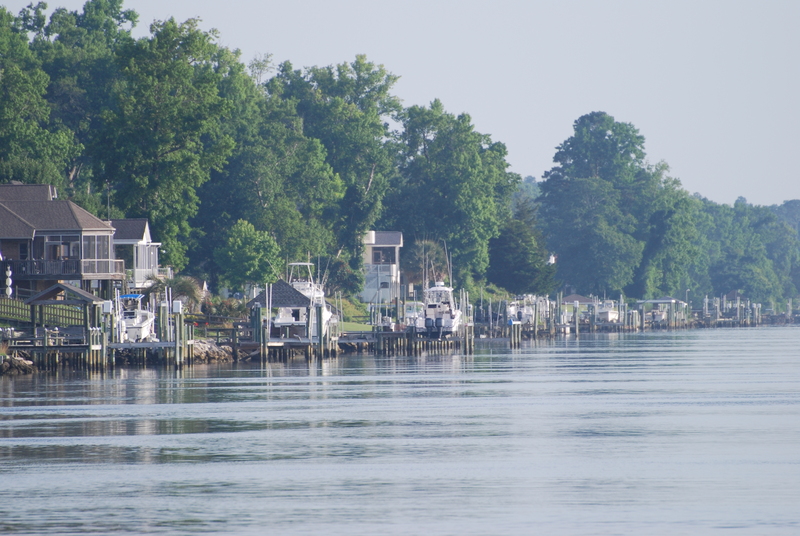 A short trip up the Pungo River and we enter the narrow Pungo/Alligator canal. Wouldn’t you know, the Island Express, a large barge, is entering the canal just ahead of us. We will need to pass him as he is going only 4 mph. There are warnings that the canal is foul with debris on both sides, with only 90 feet width of good depth. Not much room to go around this guy. We radio him and ask if he could move over just a little and do a ” slow bells” pass. He agrees and very kindly slows down for us to ease by. We travel this canal for the next 25 miles passing one more barge headed south. The channel then dumps us into the four mile wide Alligator River. After another 20 miles, we enter the Albemarle Sound. 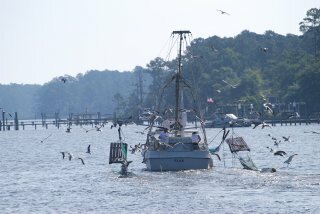 Our 14 mile crossing is uneventful other than dodging the many crab pots. After crossing the sound, we enter the North River for a short time and that takes us to another canal known as the Carolina Cut. This canal takes us through some beautiful marsh areas. A few miles later we stop for the evening at Coinjock Marina. 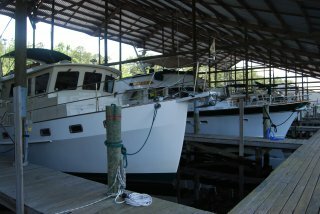 It’s not really a marina, just a long 1100 ft. face dock right along the ICW. Their big draw is the restaurant which offers a 32 ounce prime rib. Jeff has devoured this in the past and had all intentions of a repeat. However, the stuffed flounder with crab won out this time. The prime rib will have to wait until the fall. It’s another short day of travel so we take our time leaving Coinjock. We are on the North Landing River for much of today’s journey. This river is very scenic as we travel through the lush green wetland marsh. Meandering around bend after bend, we come upon numerous osprey. 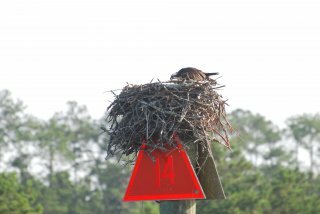 It seems every channel marker is topped with a nest of sticks collected by the birds. Unfortunately Jeff doesn’t get to enjoy this scenic cruise as he spends much of the day down in the hold fixing a water leak. Over the past two days we have had four fresh water leaks from the hoses leading to our shower and sinks. Why is this occurring? Over the last nine years we have experienced only one leak. Why so many leaks now? We think the extreme hot 95 degree temperatures have something to do with it. Luckily we have caught all the leaks before any major flooding. As we get closer to Norfolk, the VHF radio traffic has dramatically increased. We listen to both civilian and military marine broadcasts. Our ears pick up as we hear of a submarine approaching the Norfolk Navy yard. All traffic is warned to divert a mile away from the sub. The Navy takes their security seriously. 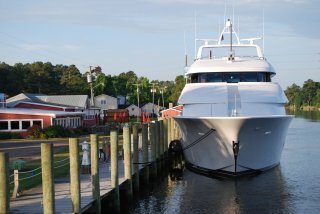 After two swing bridge openings, we arrive to Atlantic Yacht Basin in Great Bridge, VA. This will be Idyll Time’s home for the next four months. She is soon secured in shed # 6 with large yachts on both sides of her. 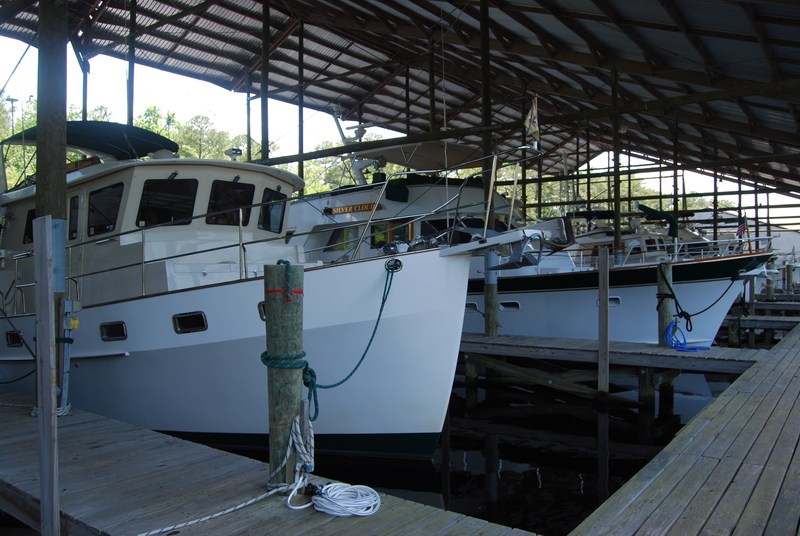 We chose AYB to store our boat because they offer covered slips in fresh water, 24 hour security, a competent and experienced staff to do boat repairs, and reasonable protection from Atlantic hurricanes. We have over wintered here twice before and feel good about leaving IT in their hands. James Taylor, the yard foreman has been here for over 35 years. AYB was started in 1926 and is still a family run business. The next three days are spent preparing IT for her summer rest. First project was to completely wash her exterior and polish all of the stainless fixtures. This is a two day job. Jeff spends part of a day in the engine room changing oils, filters, and zincs while I attend to numerous cleaning chores inside. After three long days of work, IT is in top shape. After traveling over 2000 miles from Chattanooga, TN to Great Bridge, VA, Idyll Time is now resting safe and sound until our return in the fall. This entry was posted on July 3, 2015 at 9:25 pm. You can follow any responses to this entry through the RSS 2.0 feed. You can leave a response, or trackback from your own site.